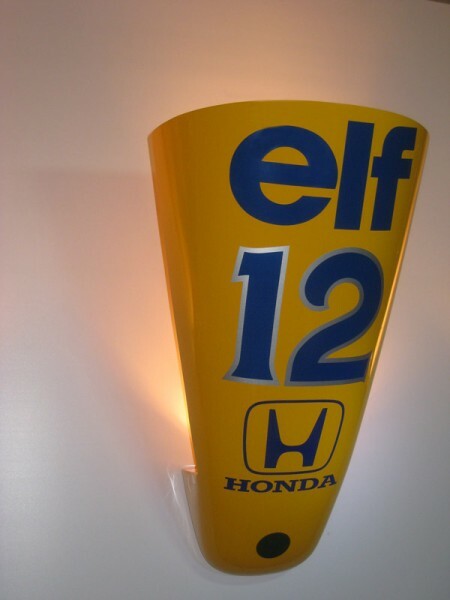 "Lampe Lotus type 99T replica nosecone"
Nose cone Original Replica von Ayrton Senna's No. 12 Lotus type 99T. Das ist mehr als nur ein Lampe. Das ist ein gutes Stück Rennsportgeschichte die leuchtet. Der Formel 1 Wagen in den Farben des Camel Team Lotus erwies sich als sehr konkurrenzfähig in den Händen von Ayrton Senna, der seinen ersten Monaco-Sieg und den letzten Grand Prix-Sieg des Teams bei Detroit realisierte. Team Lotus was proud to display the green and gold Team Lotus version of the traditional Lotus ACBC nosebadge on the nose of the type 99T. This was especially appropriate as the 99T featured yet another great Lotus innovation, namely Active Suspension. The 99T proved to be very competitive in the hands of Ayrton Senna, who realised his first Monaco win and the team's last Grand Prix win at Detroit. Weiterführende Links zu "Lampe Lotus type 99T replica nosecone"